Continuously striving to produce world-class equipment that delivers customers with the highest value possible, John Deere added Final Tier 4 engine technology to the 944K hybrid wheel loader, providing customers an increase in fuel economy from the Interim Tier 4 model. Other machine updates include improving operator comfort and increasing uptime, while lowering daily operating costs. Equipped with a 536-horsepower, Final Tier 4 John Deere PSS 13.5-liter engine, the 944K boasts nine to 14 percent lower fuel consumption* compared to its IT4 predecessor. The updated engine delivers impressive torque and responsiveness to help maintain good boom and bucket speed in and out of the pile for heaped loads. Along with the engine update, operators will also enjoy an increase in coast control performance. This standard feature gives the operator the capability to adjust the aggressiveness of the machine during deceleration with three different settings. The higher the setting, the more electric braking will occur during application. 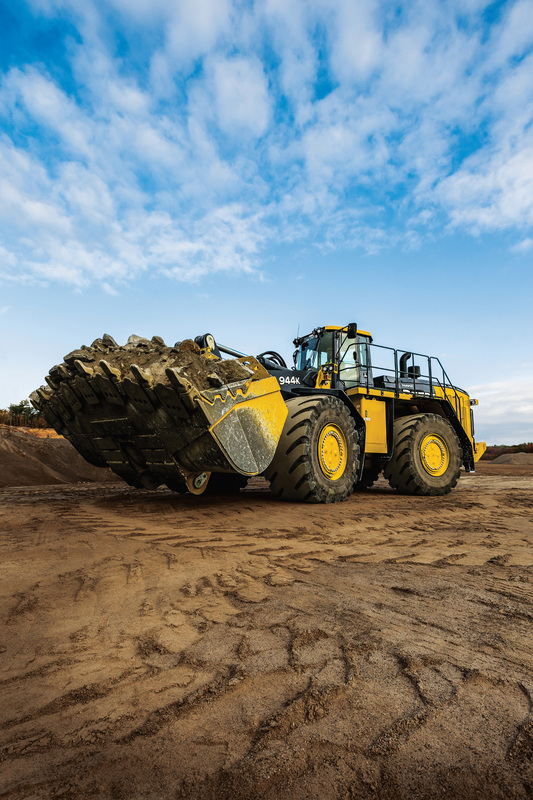 When all three lights are on, the loader will deliver a 33 percent increase in deceleration performance and an overall extension of service brake life. Other machine modifications include the addition of a heated and ventilated cab seat to provide maximum comfort to the operator. With improved Final Tier 4 technology, operator and bystander noise levels were also lowered. Outside the cab, remote jump-start terminals were added to all 944K FT4 machines in a closed and locked engine compartment. These allow for faster and easier jump-starting, can be used with a trickle charger in cold weather and are colour-coded/insulated to help prevent improper connections and accidental contact with battery terminals. Other updates include a bolted shut engine fan door that reduces the possibility of it accidentally opening during operation; the consolidation of the engine stop switch and 24-volt electrical disconnect switches on the right side of the machine to provide easier access; and the relocation of the engine block heater plug-in for easier access in colder climates. Warranty coverage on the 944K wheel loader includes a 96-month (eight-year) or 20,000-hour (whichever comes first) nonprorated assurance on wheel motors, generators, power inverters and brake retarders. This offer was extended to July 31, 2019 (from October 31, 2018) to existing machines in the field and on new 944K loaders. 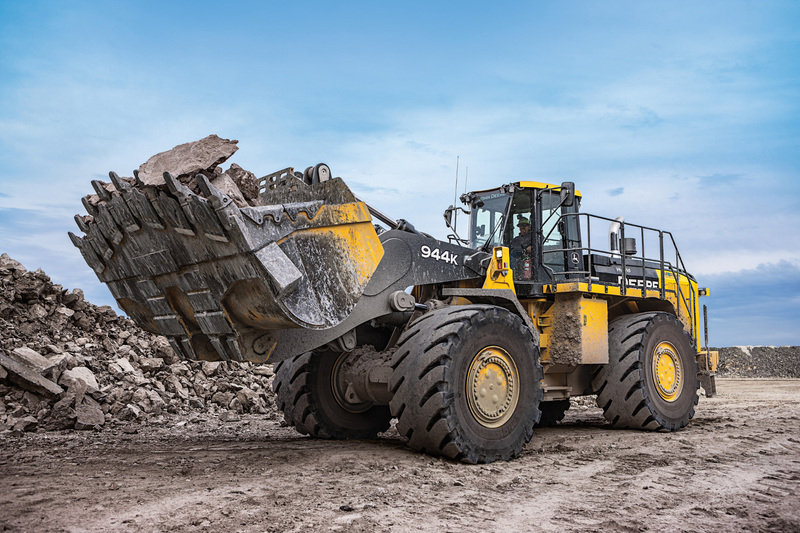 Fleet managers looking to get the most out of their 944K wheel loader can rely on their John Deere dealers to provide Ultimate Uptime, featuring John Deere WorkSight. With Ultimate Uptime, owners receive predelivery and follow-up inspections that include five years of JDLink™ telematics, machine health prognostics, remote diagnostics, programming capabilities and the ability to add dealer-provided uptime solutions to a customized package. For additional information, visit https://www.JohnDeere.com or contact your local dealer.